Returning to the darkness that he was so comfortable with on his first two albums, Blockhead sounds like he's home and loving it. 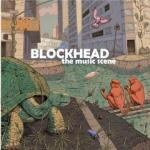 Levity doesn't come easily to Blockhead. After two albums in two years of dense, moody, dark instrumental hip-hop, Blockhead's answer to those who would tell him to lighten up appeared in 2007, a limited edition release called Uncle Tony's Coloring Book. Uncle Tony's Coloring Book still sounded like Blockhead, but it sounded like a version of Blockhead that was actively trying to push a little happy into the still-dense mix. The result was an interesting album that was undoubtedly well-constructed, but just didn't seem as though it felt comfortable with its own identity. It was almost impossible to tell whether the good vibes, when they appeared, were borne of sincerity or irony. ...after which the list turns into things he hates. The guy just can't fake happy for too long. The Music Scene, then, returns to a version of Blockhead that truly sounds as though it's a reflection of the man behind it. By returning to the darkness that he was so comfortable with on first two albums Music by Cavelight and Downtown Science (not to mention his highly celebrated work with Aesop Rock), Blockhead sounds like he's home and loving it. The very first track, "It's Raining Clouds", stands head and shoulders above anything he'd done previously in his solo career, setting an awfully high bar for the rest of the album. It starts off like the typical Blockhead track, with a slow-to-mid-tempo hip-hop beat, ominous synths, and a well-placed vocal sample. A little more than halfway through, however, it turns into an uptempo breakbeat workout no less dark than the typical Blockhead track but somehow more energetic. It's the type of track that sounds like a mission statement, a statement of intent to push his sound into places it hasn't gone before, even as it sounds as natural coming out of him as anything on those first two albums. Even if the rest of the album never quite manages to hit the heights of "It's Raining Clouds", there are certainly a fair share of high points to find throughout, most of which evolve from foundations reminiscent of Music By Cavelight or Downtown Science. "Attack the Doctor" starts out with one of the slow-tempo rollers he could probably crank out in his sleep at this point, but about halfway through the track, this absolutely nutty vocal melody shows up, turning it into something a little crazy, a little disturbing. A metal guitar sounds as though it's going to fade in, but it quickly gets cut out by by a slow acoustic line before it even has a chance to complete the fade. Turns out, it's foreshadowing for "The Daily Routine", bar none the darkest of the dark on this disc. Those sludgy metal guitars that we almost heard in "Attack the Doctor" are low in the mix, providing texture for the beat behind them and taking a backseat to a very human shouting match that shows up intermittently to make us uncomfortable. This is powerful music; this is art. It's a harsh statement of just how awful we can be to each other on a daily basis. As Blockhead expands his reach, however, those tracks that don't scale such heights stand out as weak. "Tricky Turtle" tries to survive on a silly vocal sample that seems designed to introduce levity, but just comes off as distracting. "Which One of You Jerks Drank My Arnold Palmer?" might be the best song title in recorded music so far this year, but it's a cover for an utterly unremarkable bit of filler. Even the title track, despite another well-placed vocal sample, carries a decent beat and nothing more. It's tough to bridge the gap between good and great; if your album is consistently good, it'll be respected but not adored. If your album contains any greatness at all, the mediocre bits that exist are magnified. Parts of The Music Scene flirt with and even achieve greatness, standing tall as instrumentals any music fan would be advised to hear. Regrettably, the tracks in the box labeled "same old Blockhead" stick out amongst such greatness, keeping the album from achieving same. Still, now we have an idea of his potential.